[page 51] About this time, Grinder and Bandler's college classes and evening groups were attracting an increasing number of students eager to learn this new technology of change. By word of mouth, this new approach to communication and change began to spread across the country. Steve Andreas, at the time a well-known Gestalt therapist, set aside what he was doing to study their techniques. He quickly decided that NLP was such an important breakthrough that, with his wife and partner Connirae Andreas, they would record the seminars of Bandler and Grinder and transcribe them into books. Their very first one, Frogs into Princes, would become the first NLP best-seller. If one person can do something, anyone can learn to do it. The mind and body are parts of the same system. People already have all the resources they need. People are always making the best choice (s) available to them. If what you are doing isn't working, do something else. As I write this, it's been over twenty years since 1977 when I attended my first workshops with Bandler and Grinder, after spending some six months studying their books, Structure of Magic I & II and Patterns of the Hypnotic Techniques of Milton Erickson I&II. By the year 2000, I have fully assimilated all but two of the above presuppositions and recommend them all highly for those people for whom one or more may be a novel way of looking at their personal experience. I would extend the third presupposition in the following way: "If there is a process that one person can do, then all persons are doing that process, and for most persons, doing it out of their awareness often with undesirable results." NLP works at the first three steps of habit formation. The trainer shows you things to do that you have never heard about before. This revelation moves you into Step 2: you now know about something, but haven't the foggiest idea how to do it. You sign up for the NLP training, and via didactic and experiential practice, you learn to do with conscious effort the new techniques. Then you graduate with certification. If you decide to become an NLP Trainer, you take more courses, and keep all the techniques ever conscious in your mind so that you may train others through the first three steps. If, however, you decide not to become a trainer in NLP, the techniques fall into the area of unconscious competence and enrich everything you do in life. When you have reached that plateau, you will find it boring to attempt to teach it to others. Teachers are people who are still learning the subject they teach - they are happy at step three: increasing their conscious competence in their field of study. That's why teaching can become a lifelong career for some. For others the techniques of NLP fit into one's tool bag with every other process and one never considers whether what one is doing is NLP or not. The best measure one has about whether one has reached this stage or not is a feeling, a deep knowing, that one is bored from reading introductory NLP books like this one. 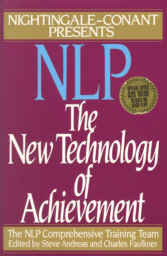 If you're ready for the ABC's of NLP, this is the book for you.